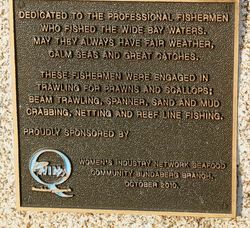 The monument commemorates the professional fishermen who have fished in the adjacent waters of Wide Bay. Within the parkland seats have been donated and installed by families of deceased fishermen. 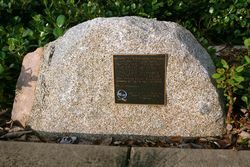 Each park bench has a plaque attached in their memory. Queensland Women's Industry Network Bundaberg worked closely with the Bundaberg Regional Council on this project to erect the memorial to remind people that Burnett Heads was once the hub of the fishing industry in Wide Bay. Who fished the Wide Bay waters. Calm seas and great catches. Crabbing, netting and reef line fishing.